The final chapter in the massive and needlessly overlong adaptation of J.R.R. Tolkien's prequel to the battle for Middle-earth saga, 'The Hobbit: The Battle of the Five Armies,' arrives more with a whimper than as the exciting conclusion to the grandiose adventure it originally set out to be. Or better yet, once the dust and smoke settle from the nearly hour-long battle to reclaim the Lonely Mountain, audiences are likely to exhale a sigh of relief than applaud with satisfied enthusiasm. It's not so much that the movie is bad — though it's not great or quite as good as the previous two — as there is a general sense and feel of liberation, that it's finally over after three years and three films imagined from one book. That may sound more negative than positive, but that's only because this final installment seems content to exist right at the cusp between a shoulder-shrugging meh and an adequately mediocre accomplishment. Walking into it largely from an obligation to see the entire Middle-earth series come to a full, complete circle, Peter Jackson's film is neither a total disappointment nor is it the overwhelmingly gratifying conclusion initially imagined. Not sure if it's from a feeling of exhaustion, after spending so much time in this epic fantasy world, or because the previous two entries were honestly tepid starters leading up to this, raising expectations higher than could be achieved. Even the battle sequences, as stunning and magnificent as they are to witness on the big screen, digital characters, monsters and landscapes that look spectacularly lifelike thanks to the talented folks at Weta Digital and the skillful direction of Jackson, fail to truly captivate and immerse the viewer. In spite of the wild imagination and thrilling visuals on display, the clash between the dwarves, elves, humans and eagles against a terrifying horde of goblins and orcs doesn't quite measure up to the encounters seen in 'The Lord of the Rings' trilogy. Part of the problem can be a sudden loss of interest with the many characters involved and several key moments feeling rushed while others linger for longer than necessary. Then there's also an unexpected desire to have the whole affair simply come to a close as personalities clash over who has a rightful claim to the share of the gold Smaug guarded. Of course, some will be quick to point out that Thorin (Richard Armitage) is largely to blame since his gold lust and obsession for the Arkenstone blinds him from peaceful negotiations for promises made to the Bard (Luke Evans) and the people of Laketown. Elvenking Thranduil (Lee Pace) also desires certain necklace of white gems, creating an alliance with the humans to invade the mountain if necessary. With Smaug now dead, Azog and his Orc army want the mountain for its strategic position as a stronghold, and if dwarves die in the process, all the better in his eyes. There're lots going on and none is of major interest, except perhaps the fight between Thorin and Azog, which I admit was quite satisfying. It's a real shame, to be honest, because 'The Hobbit: The Battle of Five Armies' picks up immediately where the second film left off with explosive action and mayhem as Smaug (voiced by Benedict Cumberbatch) sets Laketown ablaze. It's a promising start, visually potent, dynamic and energetic, but it the excitement quickly subsides with scenes of Bard leading people to the ruins of Dale for shelter and Thorin turning dictator commanding his loyal dwarf company in search of the Arkenstone or risking their lives for the gold. Yes, this is taken directly from the book, but it's a bit boring to watch on screen. 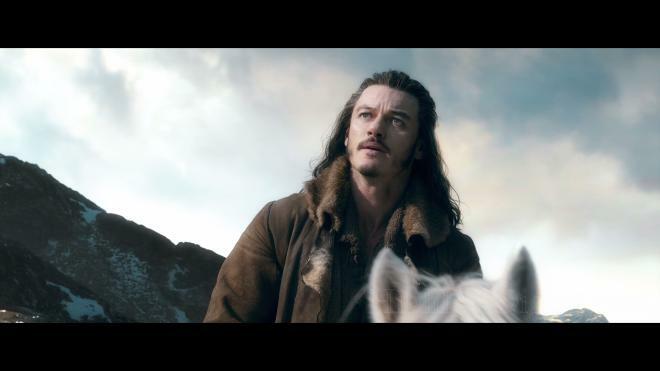 And this made the worse by the made-up melodramatic romance of Tauriel (Evangeline Lilly) and Kíli (Aidan Turner) while Legolas (Orlando Bloom) watches dopey-eyed from a distance. 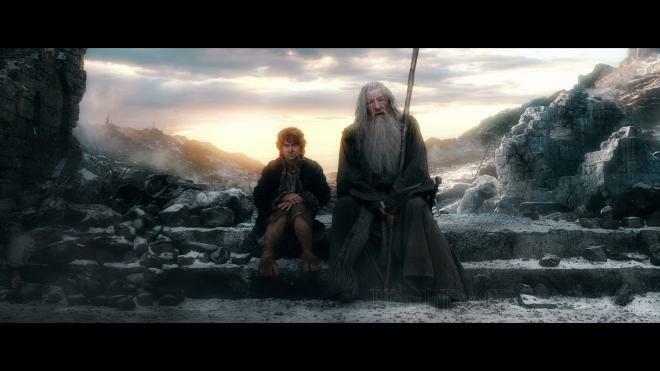 Through all this, Gandalf (Ian McKellen) and Bilbo (Martin Freeman), our initial heroes of this epic saga, are treated like side characters, their influence to the plot circumstantial. Altogether, Jackson's closing chapter to the series is not a complete loss, but it's also not the electrifying finish promised by the previous movies. In the film's extended form, the additional 20 minutes neither improve nor ruin an already strong and fairly satisfying finish to the trilogy. However, the extended scenes — some so minor as to be barely noticeable while others quite apparent — are just enough to arguably make this version slightly more entertaining than it's theatrical counterpart. Several new scenes are negligible, easy-to-miss bits of dialogue that create a better flow and pace. There's also a bit more action during Gandalf's rescue at Dol Guldur. The most significant differences, and the ones more likely to attract fans, are the longer battle sequences, especially a terrifically entertaining exchange and initial conflict between Dáin's and Thranduil's armies just before the Wereworms show up. In Dale, Gandalf has a brief encounter with a large troll where we also witness Alfrid's appropriate comeuppance while the dwarves drive a war machine pulled by goats towards Ravenhill and Azog. Perhaps, the best and most welcomed addition is a longer, more emotional funeral procession for our three fallen protagonists and Dáin's inauguration. 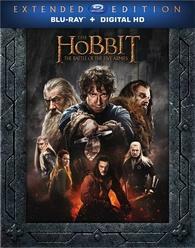 Warner Home Video brings 'The Hobbit: The Battle of the Five Armies Extended Edition' as a three-disc Blu-ray package with an UltraViolet Digital Copy code. Housed inside a black, eco-elite keepcase with a middle panel that holds two discs on either side, all three discs are Region Free, BD50s, and the whole thing comes with a sturdy, attractive slipcover lightly textured to simulate leather and a glossy picture in the center. This extended edition of the film adds 20 minutes of dialogue and extended battle sequences to the theatrical runtime of 144 minutes, bringing this version to 164 minutes total, which also makes it the shortest of the three films. Viewers are taken straight to an animated main menu screen with music and full-motion clips. 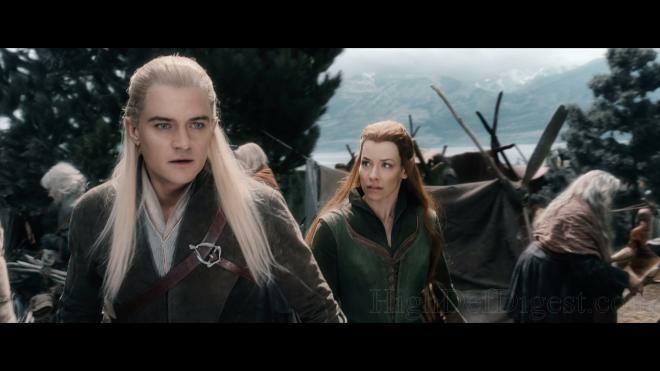 Not surprising, the extended edition arrives with a video presentation not all that different from its predecessors. In fact, my initial impression remains the same, as the final installment in the fantasy-adventure trilogy erupts on the screen with a superb 1080p/AVC MPEG-4 encode. The all-digital photography of Andrew Lesnie astonishes with razor-sharp clarity and definition, exposing the tiniest flaw and imperfection in the clothing, armor, buildings and various weapons seen throughout. Individual hairs are distinct, and the textures of the fabric in the costumes are very well-defined and lifelike. Facial complexions are highly revealing as well, showing every wrinkle and pore in the faces of the cast. Presented in a 2.40:1 aspect ratio, the video is energized by a wide, sumptuous array of colors. Primaries lavish every frame with bold vivacity while a varied assortment of secondary hues provides warmth and animation. A crisp, brilliant contrast allows for extraordinary visibility in the distance, exposing the tiniest objects in the background and the fine lines of various rock formations scattered throughout the New Zealand landscape. 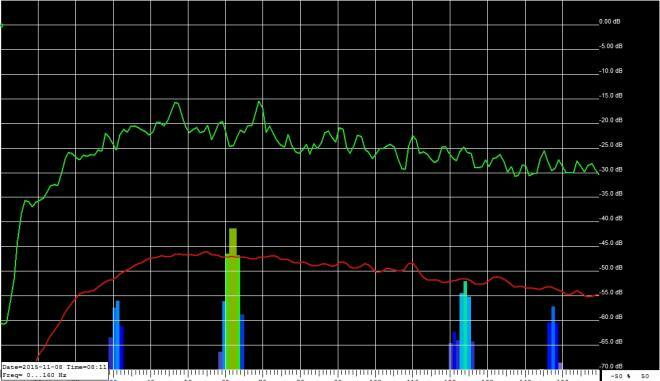 As with the previous two movies, the brightness levels are the presentation's only minor drawback. A majority of the runtime shows accurate, rich blacks, but there are several shadows which appear noticeably murky and somewhat faded, flattening the picture a tad during a few sequences. There are also a couple instances of trivial aliasing along the finest metallic lines around the armor worn during battle. However, they are not enough to completely ruin the film's enjoyment. Like the video, the epic battle rages with the same reference-quality DTS-HD Master Audio soundtrack heard in the previous theatrical edition. The design offers distinct clarity and superb definition in the mid-range, generating a brilliantly wide and engaging soundstage. The tiniest pop and sizzle of crackling fire burning the wooden structures is distinctly heard while the clanging, clashing sounds of metal on metal is extraordinarily detailed, echoing throughout the room. The upper ranges during battle scenes never falter and are precise without a hint of distortion, allowing for every scream and wail to be heard above the chaos while dialogue remains intelligible. Along with the excellent dynamic range, bass plays an appreciable role in Howard Shore's thrilling musical score, adding a great deal of depth and weight to the orchestration. The low-end is powerful and robust enough, making the battle sequences rumble with palpable excitement, but sadly, it's not as effective as the last films, almost a bit disappointing, as it never really digs deep into the ulta-low depths (bass chart). As with the previous two releases, the rears deliver a variety of subtle ambient effects with the scenes of war and mayhem providing an awesomely satisfying environment. Battle cries and howls effectively surround the listener while arrows fly overhead to the back and swords swing from one side to the other with fluid panning, creating a stunningly immersive 360° soundfield. Though it's not as consistent as its predecessors, the final chapter in the trilogy comes with a marvelous and highly-enjoyable lossless mix. New Zealand: Home of Middle-earth Part 3 (HD, 6 min) — Peter Jackson, cast and crew travel the various shooting locations across the New Zealand landscape and share their thoughts while explaining how they transformed it to represent Middle-earth. In the Dungeons of the Necromancer (HD, 30 min) — Cast and crew share their thoughts on the production set of Dol Guldur, the performances and characters while having some fun as well. Fire and Water (HD, 30 min) — A behind-the-scenes look at the making of Lake-town's destruction, constructing the iconic black arrow and CG work behind Smaug's death. Under the Shadow of the Mountain (HD, 18 min) — While on location in the remote Rock and Pillar Range, the cast and crew are met with some unexpected weather, bringing forth some new challenges. In the Wake of the Dragon (HD, 27 min) — A look at some very enthusiastic extras filming at Lake Pukaki while cast members receive a few unforeseen surprises, particularly Luke Evans. The Gathering of the Clouds (HD, 30 min) — As filming nears its end and the entire crew finds itself in a time crunch, cast members break the tension with some fun and laughs. Many Paintings (HD, 30 min) — The final goodbyes in the film turn out to be more heartfelt than expected and Jackson presents everyone with a gift as principal photography wraps. The Clouds Burst (HD, 30 min) — Interviews and BTS footage of cast and crew showing everyone in high spirits, but a fire on set interrupts shooting for a few days. A Last Desperate Stand (HD, 30 min) — Orlando Bloom and Ian McKellen give their final performances as the fictional iconic characters while Evangeline Lilly and Richard Armitage talk their memorable moments on set. 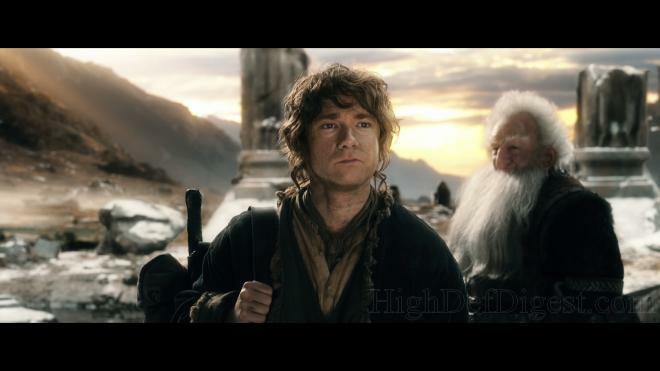 Out from the Gate (HD, 30 min) — The Dwarf actors film their charge out of Erebor while looking at more CG work, and Martin Freeman gives his final farewell to Middle-earth. The Last Stage (HD, 34 min) — On the final days of shooting finds Jackson posting on Facebook, Armitage's last performance and an emotional but fun wrap ceremony. Beneath the Thunder (HD, 90 min) — Broken into three segments that can be watched individually or sequentially, the documentary chronicles the creation of the final battle sequence, from designing the look and military tactics to carefully incorporating the digital filmmaking. The Peoples and Denizens of Middle-earth (HD, 88 min) — A closer look at the casting and stage production while giving special attention to characters Tauriel, Thranduil and Dáin. Realms of the Third Age (HD, 90 min) — Follows the construction and completion of Dale, Dol Guldur and Erebor by the art department and the design work of Weta Digital. Farewell, Friends! (HD, 33 min) — Precisely as the title implies, a collection of BTS footage and interviews looks at the end of a fifteen-year journey to bring Tolkien's mythology to the screen. Bonus Features (HD) — Three more featurettes show Jackson and McKellen surprising Harry Knowles for his birthday (12 min), Jed "Nori" Brophy performing "Rivers of Gold" music video (5 min) and a one-on-one conversation with actor Adam Brown. Andrew Lesnie Remembered (HD, 6 min) — A special and fairly emotional commemorative piece for the late cinematographer behind all 'The Lord of the Rings' and 'The Hobbit' films. The final chapter in the massive and needlessly overlong adaptation of J.R.R. Tolkien's prequel to the battle for Middle-earth saga, 'The Hobbit: The Battle of the Five Armies,' arrives more with a whimper than as the exciting conclusion to the grandiose adventure it originally set out to be. Featuring the same cast from the last entry, the conclusion isn't a waste, but it's also not the electrifying finish promised by the previous two movies. The "Extended Edition" arrives with the same stunning video and a reference-quality audio presentation, and it includes a treasure trove of special features sure to please and satisfy the loyal fans who waited for this release and finally see the end of a fifteen-year journey.